Wemyss Bay pier will close on October 1, 2015 for 24 weeks for major repairs. Wednesday, September 30 is the last day of normal ferry services between Rothesay and Wemyss Bay before the mainland terminal is closed for major improvement work. 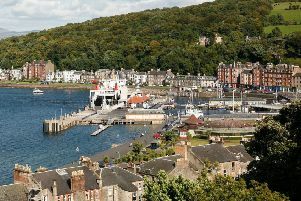 From Thursday morning and for the next 24 weeks, Rothesay’s ferries will be diverted to sail to and from Gourock while the linkspan and pier at Wemyss Bay are repaired and refurbished. The first sailings of the day on Thursday are at 5.50am from Rothesay and 7.15am from Gourock; the last sailings are at 7pm from Rothesay and 8.10pm from Gourock. Thursday, however, also sees the introduction of RET fares which will lower the cost of a single journey on the route to £3.05 for a foot passenger and £10.95 for a car. Full details of the alternative arrangements which will apply for the duration of the Wemyss Bay work can be found at CalMac’s website - but for ease of reference, departure times from Thursday onwards are as follows. From Rothesay: 0550, 0650, 0835, 1015, 1130, 1325, 1450, 1625, 1755, 1900. From Gourock: 0715, 0845, 1000, 1200, 1315, 1455, 1615, 1745, 1915, 2010. From Rothesay: 0700, 0755, 0930, 1105, 1235, 1420, 1550, 1715, 1835, 1945. From Gourock: 0815, 0925, 1105, 1245, 1405, 1550, 1715, 1835, 1945. From Rothesay: 0755, 0945, 1100, 1305, 1350, 1600, 1710, 1845. From Gourock: 0815, 0925, 1145, 1230, 1430, 1550, 1730, 1830, 2000.